I don’t see any appointments in Simplifeye (the app or Dashboard) even though they are scheduled in my appointment book. Appointments are disappearing or flashing in and out (all disappearing, then all reappearing later). I’m seeing the wrong set of appointments for the current workday. All of these behaviors listed above indicate that the Simplifeye Agent has stopped working correctly. The Agent is the piece of software on your server that sends data from your appointment book to Simplifeye's Dashboard and App. Restarting the Agent is a quick and simple process. Important! Make sure you're on the computer that's the server for your EHR/PM software. Ask your technical support staff if you are unsure which machine this is. 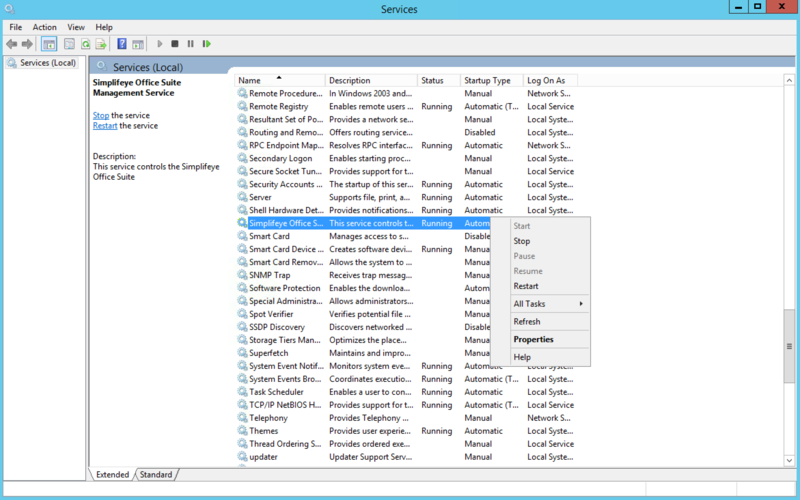 Go to Control Panel > Administrative Services > Local Services. Find "Simplifeye Office Management Suite" in the list of services. Right click on "Simplifeye Office Management Suite" and select "Restart". If the issue still isn't resolved, contact Simplifeye support.